As he prepares to tackle problems head-on in his new department, Social Protection Minister Leo Varadkar spent yesterday running away from another one. He was among 130,732 runners across the world to take part in the annual 'Wings for Life' charity run. Taking place in 34 cities in 33 different countries, the race involved competitors running away from a catcher car, with the person who ran the furthest before being caught by the car deemed the winner. Paul Martelleti won the Irish leg of the race after running 73.76km, close to two marathons, in four hours and 21 minutes. A new record was set in the Irish women's race as Sarah Mulligan travelled 46.64km before she was caught. 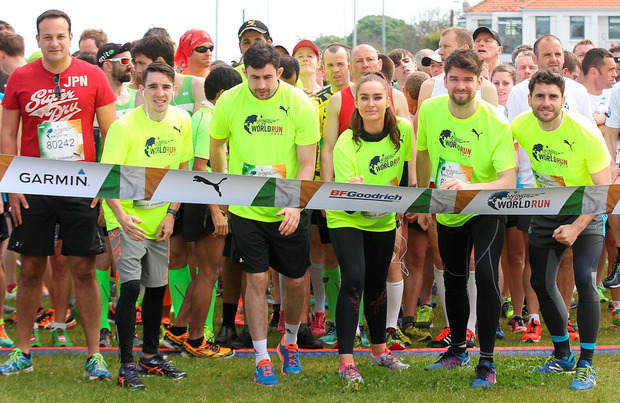 Model Roz Purcell, Dublin footballer Bernard Brogan and Olympic boxer Michael Conlon were also among those taking part in the event.